Working across EY's largest accounts. Advocate for a diverse workforce. Accomplished pianist. Loves to sail. Artificial intelligence could hardwire sexism into our future. Unless we stop it. International Women's day is the time to act. In five years’ time, we might travel to the office in driverless cars, let our fridges order groceries for us and have robots in the classroom. Yet, according to the World Economic Forum’s Global Gender Gap Report 2018 it will take another 108 years before women and men achieve equality in health, education, economics and politics. What’s more, it's getting worse for economic parity: it will take a staggering 202 years to close the gender gap in the workplace. Let's start with the facts. The chart below shows how the numbers for men and women varied across sectors in 2017 – and from talent pipeline to leadership. First, I started my career in one of the industries at the bottom of the chart. I was part of the 26% in energy and mining. I chose a career in utilities, and enjoyed it hugely until I reached a ceiling at the ripe old age of 26. The Operations Director I worked for gave me some brilliant advice. He said my next job should be his, but as this opportunity wasn’t likely to happen any time soon, I should branch out into consulting and gain international experience. Along the way, I met many talented, ambitious women who didn't get promoted into leadership positions. We need to challenge why that is happening, and why it is getting worse. Second, as I think about the future that's coming, the low number of women in software and IT services and in finance does not bode well. We are on the cusp of the Transformative Age, which will fundamentally change how we live and work. Technology – and the financing for innovative ventures – will play key roles in how that future is shaped. In an age crying out for powerful and innovative solutions – which evidence shows are best generated by diverse teams – we need to take bigger strides forward on gender parity and diversity in all its forms. Unconscious bias has proven to be a big barrier to diversity in the workplace, particularly for women trying to break through the glass ceiling into leadership positions. For real change to take hold, it has to come from the top. There are many enlightened CEOs who are actively tackling unconscious bias and pursuing diversity, but more needs to be done. I've written before about minimizing unconscious bias with blind hiring, something EY has done with great success. These practices need to become more widespread before it's too late. It's a lesson that was learned with voice-recognition software. Fifteen years ago, when the underlying technology for car systems was trained without diverse data sets, women struggled to get the systems to work. One woman who called customer service was told to give up and get her husband to set it up. Thankfully these systems have improved dramatically in recent years, but even now gender bias remains a problem. So how do we balance the realities of our current world with our aspirations for more equality and fairness? Unlike humans, algorithms can't consciously counteract learned biases. And as AI permeates more aspects of our lives, the stakes will get higher. In the same way that we are learning to tackle unconscious bias in the way we hire and promote people, we need to make sure we don't allow bias to permeate the tech that will build our shared future. Only then can we create a better working world for all of us. 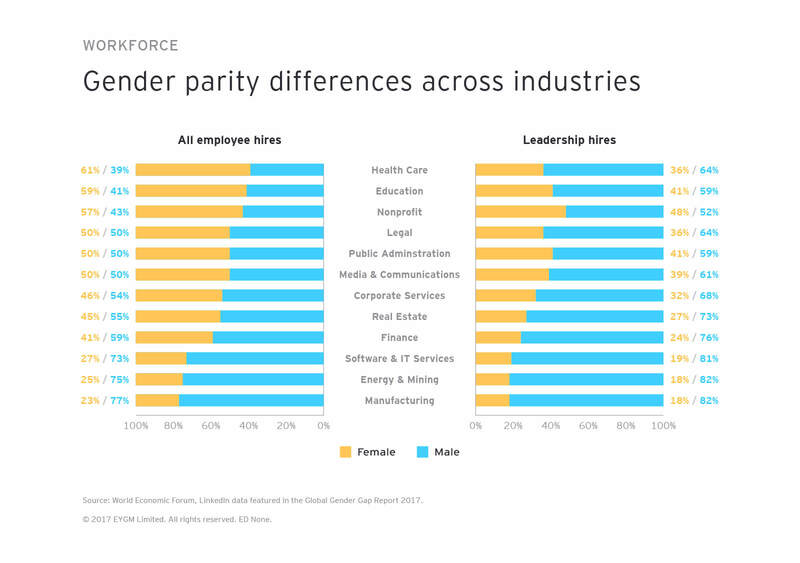 Organizations must take steps to ensure that new technologies don’t widen the gender gap.